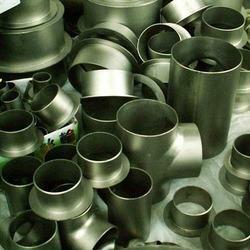 Leading Manufacturer of titanium fittings, titanium elbows and titanium piping from Chennai. We supply the industries finest quality titanium pipe and titanium fittings for our clients across a variety of industries. Whether you are looking for seamless titanium pipe or welded pipe, Uniforce can provide you with the material you need for the job. Uniforce Supplies titanium pipe spools 6” and below from both seamless (ASTM B-861) and welded (ASTM B-862) pipe, typically in schedules 10s, 40s, and 80s. We also manufacture sizes 8” and by rolling and welding annealed titanium plate (ASTM B-265) with 100% x-ray (RT) and Dye penetrant testing (DPT). Final hydtrostatic test is performed when individual titanium pipe spool is complete. 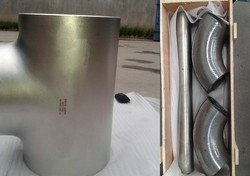 Choice of titanium grades: Commercially Pure Titanium/Titanium Alloy such as Gr.7, Gr12 and Gr 9. Uniforce Supplies a full range of titanium elbows in seamless/welded construction. These elbows are available in both Titanium (Grades 1,2 & 7) . We carry both 45-degree and 90-degree elbows. We can also custom fabricate elbows to your needs. If you can’t find what you are looking for in our range, please contact us and we will quote you a custom size. Uniforce Manufactures titanium welded pipe in accordance with ASTM/ASME standards in Grade 2 and 7 for the construction of titanium process equipment as well as for process piping Chemical Industies .Material is produced to customer order requirements in a diameter range of 3"NB to 12” NB in Schedules 10 and 40. Other international standard such as DIN or customer specific specifications can be quoted following a review by the quality assurance and process engineering departments. 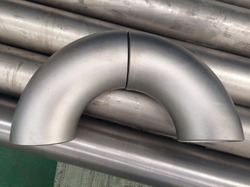 Titanium Pipes and Fittings are available in several forms. 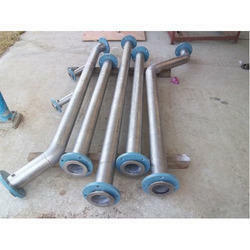 Titanium pipes are available in Seamless and Welded Pipe as well as Brake Press Formed and Welded . Titanium Pipes are available in standard NPS sizes certifiable to ASTM and ASME specifications. Titanium pipe requirements. Contact us today.